Adam reviews the 90’s Neo-Noir Thriller Throwback Gemini, written and directed by Aaron Katz. The film starring Lola Kirke, Zöe Kravitz, John Cho and James Ransone. Gemini is a breath of fresh air. While others genre endeavors steep themselves heavily into the 1980’s of John Carpenter with synth scores and long Steadicam shots, Katz has zigged instead of zagged. The Director’s newest film finds Lola Kirke on the run from the law trying to piece together the mystery surrounding her boss, a young Star played by Zöe Kravitz. From the opening moments the camera tracks palm trees and the lush score’s echoing saxophone plays, Katz’s recalls but never fully references great Wilder’s Sunset Blvd. Gemini works because it never feels like an echo chamber of hallow references. Though playing in a similar world as De Palma (Body Double) and Lynch (Mulholland Drive) it never feels like it’s a carbon copy those director’s output or anything that has come before it. By centering on Kirke’s Jill, the personal assistant, and her relationship with Kravitz’s Heather the film adds a layer never present in Neo-Noir. We care about both Jill and Heather. Katz ensures that we spend enough time with them before the plot begins in earnest. Jill may be Heather’s personal assistant there is a friendship beyond this working relationship, albeit one that may not the healthiest. We see the familiarity, the comfort these two have with one another. By the time the film fully commits to the mystery the audience is fully invested. 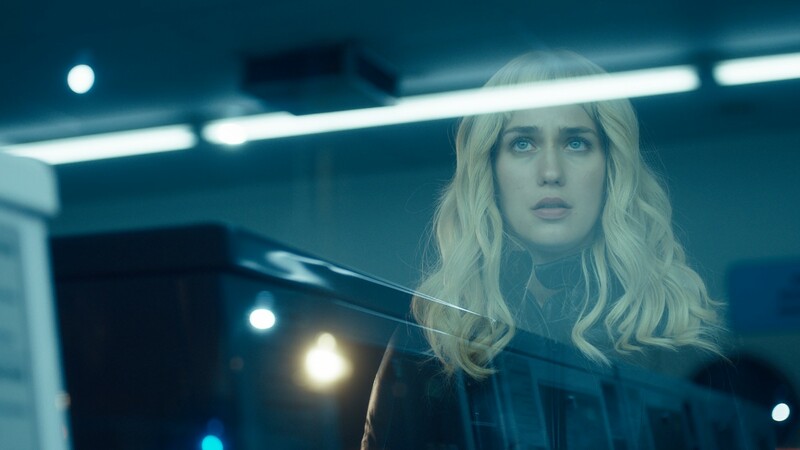 As a showcase, the film gives Lola Kirke her best role to date. Jill is not your average Noir hero. She is not a detective, ex-cop or any of the clichéd troupes that Film Noir’s saddle characters with. As things get progressively worse for Jill, she is instantly out of her element. How Jill begins to quickly adapt to this element, is one of the true joys in cinema of recent memory. The fun of the piece is seeing how Jill uses her particular skills to stay ahead of police and unravel a mystery that could put her in jail. Zöe Kravitz continues to show how powerful a performer she is becoming. The role completely sidesteps your normal “spoiled actress” clichés. Heather is a complicated young woman bonded by the chains of stardom. How Kravitz displays the anxiety, discomfort, and her codependency to Heather with a few scenes is simply stunning. Heather never feels like a one dimensional spoiled actress or vamp. That is a credit to Kravitz ample and growing skills as an actress this role that could have been classically Femme Fatale is much more complicated that that. The film recalls the psycho sexual thrillers of the 1990’s and the great Noir’s of yesteryear is merely using these conventions as a framework. Many will want the traditional Film Noir ending that Gemini purposely eschews. At its core Gemini is a modern story of friendship, anxiety, and co-dependence in our social media age. Neon’s Gemini is in theaters on March 30th.